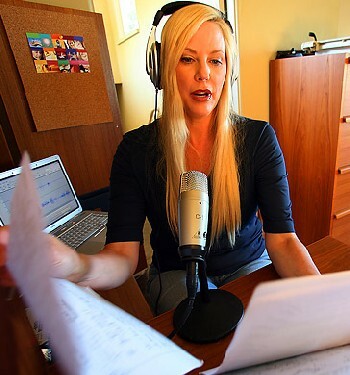 The New York Times published a photo of podcast publisher Sue Bratton today to illustrate an article on the Association for Downloadable Media. It’s a nice shot of Bratton, but there’s something wrong with the image – something that may not be important to the readers of the New York Times, but that is important to podcasters. Got any ideas or opinions? Let us know in the comments…. No microphone breath shield. Oh those popping “P”s hurt my ears already. The only thing I can see is she’s not using a pop filter. The microphone switch is in the off position? her mic *looks* like it’s aimed at her but it’s really aimed at the camera. also since it’s a USB mic the delayed audio in her headphones would make it more of a distraction then anything else. (speaking of which, the light isn’t on the mic, so she’s not recording in this photo). As for the headphones, she might be choosing not to listen to her spoken feedback but only the rest of the audio she’s mixing into her podcast. I don’t think she’s close enough to need a pop filter. The “aim” of the mic shouldn’t be that big a deal if she’s talking loud enough and her input level is good. It looks like it is if that’s the graphic of what she’s recording back there on that computer behind her. The only thing I could think of is she’s not wearing a LibSyn t shirt. If it’s all that important to podcasters, you’d think it would be more obvious, like an extra wearing sneakers during the filming of a battle scene for the Revolutionary War would be to a historian or a war re-enactor. To me, it’s just a bunch of blowing smoke. Of more interest is the substance of the story that this photo is a part of. How many podcast consumers would like it if we were to add tracking software to the podcasts they download? Isn’t that just another form of Spyware? Isn’t that a better debate than guessing what minute detail is “wrong” with the picture? misspeter & Kevin Crossman had the closest answer to what I was looking for. The suggestions to use a pop filter and turn the mic on are good ones, too! Wichita – Bratton would probably look great in a LibSyn shirt – but that wasn’t the answer I was looking for! The way the photographer shot this photo, it looks like Bratton’s talking in the end or the back of the microphone, instead of the front of the microphone. The front is where the microphone is designed to be most sensitive. The way its set up in the photo, the mic is likely to pick up the shuffling of her notes really well, and also lots of background noise or room sound. Bratton’s mic looks like it’s a Behringer C-1, a starter condenser mic. The front of this mic is indicated by a logo and an LED. When you speak into this mic, Behringer recommends talking directly into the front of the mic (so that you’re looking at the logo). 6-12″ away is usually about right for most people. The mic should be turned around so its front is facing Bratton and raised so it’s about at the level of her mouth. That might not make as pretty of a picture – but it would sound better. Unfortunately, a lot of mic manufacturers aren’t very good about telling you how to use their mics…so make sure you know where the front of your mic is! Eric – this stuff isn’t obvious, because mic makers don’t explain it. You raise a good question about podcasting tracking. I think it’s too soon to try and judge what the Association is trying to do. Tracking standards could level the playing field for podcasters, or the Association could put its weight behind some proprietary technology that screws indie podcasters. I suspect that the placement of the mic has more to do with what makes for a good photo than what is practical, and it was the photographer, not the podcaster, who decided placement. If you’ve ever been part of a publicity shoot, whether it’s a photog you hired or one that was assigned to shoot you for a newspaper, you’ll know what I’m talking about. Inside Edition covered us once and instead of taping one of our shows as we do it, they had us stage a shoot which was completely uncharacteristic of our norm. But that’s big media for you! Also, I should point out that the lens they’re using is very wide angle, and that makes accurately judging distances and angles difficult. In short, I wouldn’t be too quick to blame Ms. Bratton for her lack of mic savvy. She probably does use the mic correctly. This looks like a staging issue. You’d think the head of the podcaster’s association would know how to use a mic! And I don’t care who is taking the photo, I’d never allow myself to be photographed using the mic incorrectly. Can you imagine a photographer trying to get Tiger Woods to hold his golf club incorrectly in order to get a good shot? I don’t think so. Don’t worry about people adding tracking spam to your podcast file. Look at the media player on your computer itself. iTunes and Windows media player ALREADY track if and how many times a audio file is played. There are already mechanisms to retrieve this information, and you KNOW that Apple is already gathering it. Actual listens are going to be a huge part of podcast metrics once all is said and done. I know Privacy statements are generally on the “honor system,” but I’ve been using Apple’s site, computers, software, and services long enough to believe them when they say they don’t share personal info with anyone out side Apple. To be sure they aree taking measurements, but until I’ve been given good evidence that they’re not sharing anything beyond generalized demographic information. My concern isn’t the podcaster’s association, but the tracking software one of the companies created for you to download with their podcasts. 2) We should be removing barriers to podcasting, not adding more. I know: It’s the ‘Twin Peaks’ orange filter!